New Delhi, July 20 (IANS) The National Basketball Association (NBA) announced on Thursday that NBA Champion Kevin Durant of the Golden State Warriors will visit India to support the continued growth of basketball in the country and coach the countrys top prospects at The NBA Academy India. Durant, the 2017 Bill Russell NBA Finals Most Valuable Player, will visit the city on July 27 to donate two new basketball courts to the Ramjas School as part of an initiative by the Kevin Durant Charity Foundation. Durant will then visit the NBA Academy India in Noida, becoming the first active NBA player to visit the academy. Durant will coach the prospects through a series of shooting, passing, dribbling and defensive drills. Later in the afternoon at the academy, Durant will lead a large-scale basketball clinic for 5,000 youth from the Reliance Foundation Jr. NBA program — 1,000 athletes will be physically present while the other 4,000 boys and girls will join virtually from Bengaluru, Chennai, Hyderabad and Kolkata via satellite link. 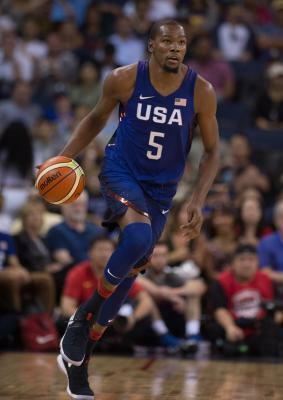 “I’ve wanted to visit India for a long time, and I can’t wait to experience the country’s unique culture and share my knowledge with the kids there,” Durant said in a statement. Durant, a 6ft9in forward from the University of Texas, was selected second overall by the Seattle SuperSonics in the 2007 NBA Draft. An eight-time NBA All-Star and the 2014 NBA Most Valuable Player, Durant averaged 25.1 points, 8.3 rebounds, 4.8 assists, 1.6 blocks and 1.1 steals per game during the 2016-17 NBA season while leading the Golden State Warriors to the franchise’s fifth NBA Championship.